Fannie Mae, Freddie Mac, the Mortgage Bankers Association (MBA), and the National Association of Realtors (NAR) have all issued their economic forecasts for 2018, including their predictions for where mortgage interest rates will be by the 4th quarter of the year. 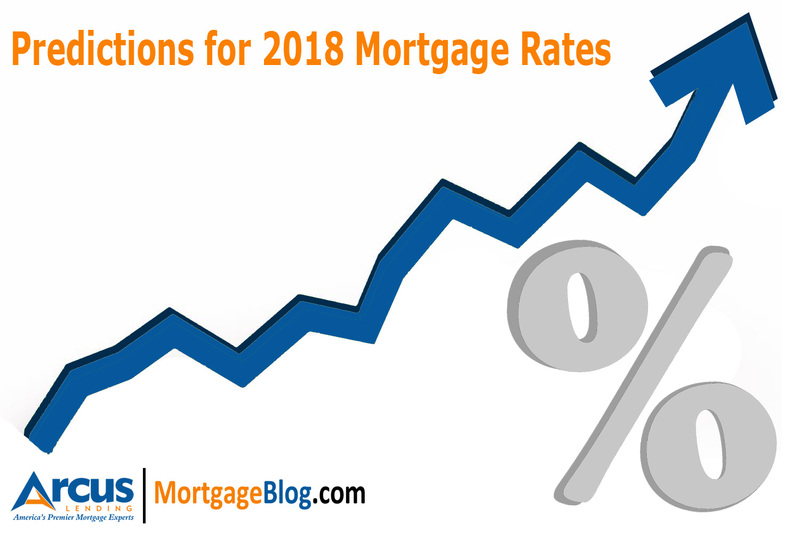 And while their attention is focused on the same key factors impacting our economy this year – individual predictions for the year ending rates range from a stable 4.1% (Fannie Mae) to a cringe-worthy 4.9% (Freddie Mac and MBA) 30 year fixed rate mortgages. Clearly — they’re not buying their crystal balls from the same place. Fannie Mae sees stronger consumer spending and real GDP growth of 2.7% in 2018, a result of a strong, continually growing economy, but sees inflation staying below the Feds target of 2%, due to expected wage increases. As a result, they see the Feds raising short-term rates once in March, and again in September 2018, with a slight potential for a third increase. This overall mild forecast includes an equally mild increase in mortgage rates, looking for 4.1% 30 year fixed rates by 4th quarter 2018. Freddie Mac’s forecast has a slightly more doom and gloom outlook for mortgage rates by year end 2018. They predict the robust economy will produce a significant rise in inflation that will be met by 3 or 4 rate increases by the Federal Reserve throughout the year. 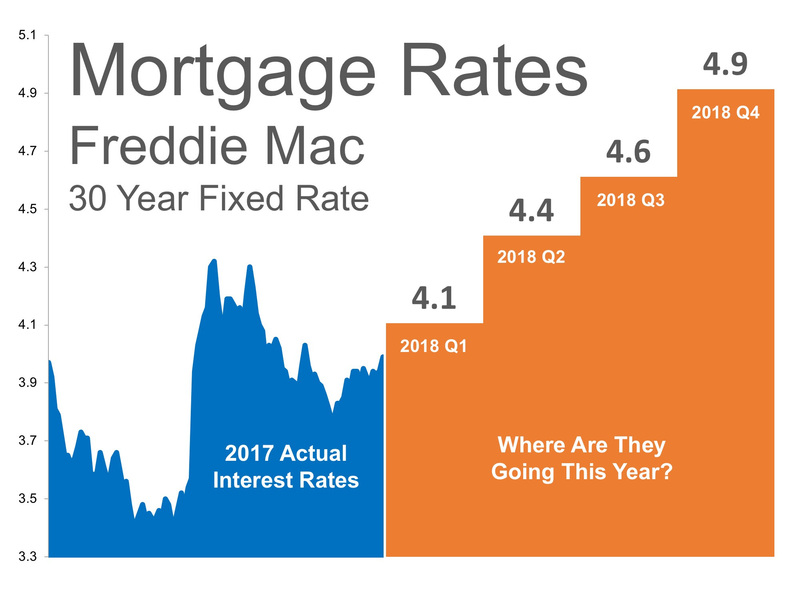 Freddie Mac predicts the increase in short-term rates will have a strong, negative impact on long-term rates, with 30 year fixed rates increasing to 4.9% 30 year fixed rates by 4th quarter 2018. However, the MBA focuses on the acceleration in the selling of the Feds holdings of Treasury securities as a strong indication that mortgage interest rates will rise this year, with the spread between the 10 year Treasury and mortgage rates widening. They also see the pressure of rising inflation and the growing budget deficit exerting upward pressure on rates. By 4th quarter 2018, they see a 4.8% 30 year fixed rate. And NAR, in a 2018 forecast offered by Chief Economist Lawrence Yun in early November 2017, made housing and interest rate predictions before the final Tax Reform and Jobs Act was signed into law Dec 22, 2017. At that time, Mr. Yun predicted the Federal Reserve would raise short-term rates 3 times in 2018, and, like the MBA, focused on the Feds’ increasing rate of selling off bonds and mortgage-backed securities as contributing direct pressure on mortgage interest rates. At the time of his presentation, and again after the Federal Reserve took no action in late January, Mr. Yun predicted 4.5% 30 year fixed rates by 4th quarter 2018. These forecasts were made before the US and European stock markets faced a huge sell-off over the early days of February, and yet the underlying basis for the largest drop in the market in 2 years echoes the forecasts of these 4 groups. After the US Labor Department released a better than expected jobs report – a massive sell-off occurred in the stock market amid investor fears over the potential rise in interest rates due to certain increasing inflation. In fact, it was already assumed the Federal Reserve would raise short-term rates at their March meeting, well before this jobs report was released. The planned increase is part of policy already in place and won’t be a knee-jerk reaction to the latest job report showing increasing wages. Where in the world will mortgage interest rates really be at the end of 2018? With a robust economy, a strong job market and long-awaited increase in wages (first time since 2009), inflation may finally begin to heat up. But is that all it takes to push mortgage interest rates up? As the MBA and NAR both pointed to – the Feds sell-off of their position in Treasury securities will have the most direct impact on mortgage interest rates. Until there is a clear market demand for these securities from other investors – stepping in as the Fed sells off – yields will continue to be high on these bonds resulting in higher mortgage rates. The sooner you can lock in an interest rate, the better, as the uncertainty of how high how fast will also be impacted by the unpredictable combination of negative global events versus positive economic recovery.